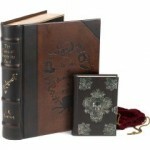 In 2007 author J.K. Rowling created seven copies of The Tales of Beedle the Bard, a work referenced in the final Harry Potter book. She gave six to people who were deeply involved with the Potter series and auctioned off the seventh for charity. It was ultimately purchased by Amazon.com for nearly $4 million. Part of the cachet of the books was that there were only ever going to be seven in existence. There will also be a collector’s edition which more closely replicates the design of the original books, including the cool skull on the cover and all the metal clasps. Yours for a mere $100. The book is very pretty. I’m nowhere near sufficiently Potterphilic to buy one, but it might be fun to decorate a blank leather journal with similar hardware.